We always make the most of any school holidays by fitting in a bit extra geocaching. And this two-week-long mid-term break is no exception. We’re halfway through and have managed to get out most days for an hour or two. Last Tuesday found us in the forest above Guéret, around the wolf park at Chabrière. A dodgy doggy place to be? Not really. 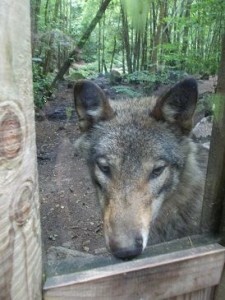 One wolf escaped a year or so ago but only because someone had cut through the fence. He was quickly found trying to get back in! Wolves, being pack animals are like our herd of llamas (apart from them being carnivorous, of course!) in that if they do get separated they’re in a panic to get back with the others. Back to the forest. It was our first visit there ever. It’s only taken us eight years to get round to seeing it. We’ve been to the wolf park a number of times but not investigated the rest of Chabrière’s 1469 hectares. The forest mainly consists of managed pine trees although there are plenty of broadleafed trees too. It is full of paths and mountain bike trails – you’d definitely need a very details map at the least, but a GPS gives you a nice sense of security. You could quite easily get lost. The geocaching didn’t go too well. It was a multicache trail we were on, but the clue to the first one seemed so convoluted – you had to count how many times each letter appeared on signposts and then magically convert those totals into co-ordinates so we gave up on that. We didn’t have anything to write stuff down on and I had a splitting headache so we’ll have another go when we’re better prepared. Anyway, we decided to go for a potter and visit a few rocks that were signposted. The whole area is one ‘chaotic granite’ with boulders strewn everywhere. On our way we passed Les Trois Amis. 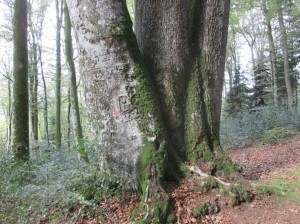 These are two massive oaks and a mighty beech tree that are fused together at the base of the trunk. You’ll be pleased to hear we didn’t add to the carved graffiti on the beech’s trunk. 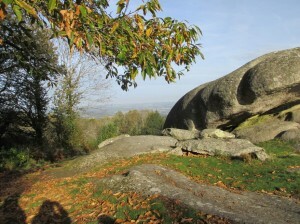 The first of the pierres we visited was the Casse-Noisette (nutcracker) rock. No obvious similarity in my opinion but a nice rock nonetheless. 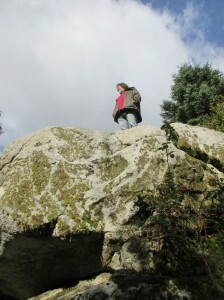 this anonymous rock Chris was standing on was more impressive. However, the Pierre Chanbranle was a wonderful discovery. It wobbles! We’d noticed a large branch sticking out from underneath the large stone which is balanced on a smaller one. Rors gave it an idle push and we were astonished to see the big one moving. Quite a lot! We all had a go. Apparently the rock was something of an oracle in the olden days. Druids would ask it questions and interpret its wobbly replies. 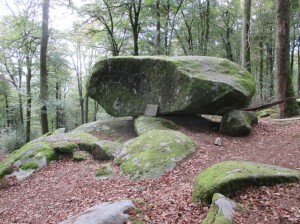 How we’d never heard about this famous rocking rock for eight years is a mystery. But thanks to geocaching we’ve found out about it. This will be somewhere we show off to visitors from now on. Here’s Rors rocking that rock! I was struck by the similarities between Chabrière and our local Pierres Jaumâtres. The PJs are another chaotic granite area, the remnant of a once-huge volcano that towered 2 km in height. We have a geocache (i.e. one we put there for our fellow geocachers to find) at the PJs and so we nipped out to check that a couple of days after visiting Chabrière. There’s now a fancy new start to the trail with irregular and narrow steps, thereby making a visit by pushchair or wheelchair now totally impossible! It was doable before, admittedly with some effort, but far from making the site more accessible this new addition is doing the opposite, which seems to go against the politically correct grain. 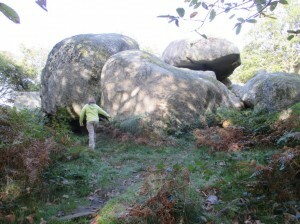 But despite that, les Pierres Jaumâtres is somewhere we never get tired of visiting. It’s a fabulous place.